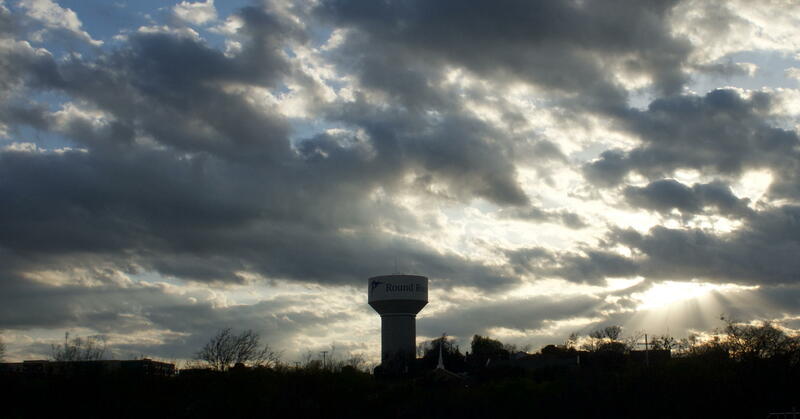 Round Rock Texas: One of the top ten places to live the American Dream. Because it was in a closed session I don’t know the specifics of the incentives offered or even the business it was offered to. That said, it is always important for progress that governments not try to pick winners and losers but rather let people in general do so by buying what products and services appeal to them. So I decided to speak a short piece before the council. I’m reproducing it here as a blog post because I’m lazy. Consider, rather than offering incentives to individual business prospects, changing the law so that all businesses, large and small, are incentivized equally to move here and, importantly, to start here. Offering incentives on a request basis means picking winners and losers. It favors those businesses that hire extra lawyers and bureaucratic navigators—that is, those larger businesses that account for a smaller number of jobs. It is far better to provide such incentives through simpler laws and lower taxes, so that individuals not experienced with navigating bureaucracies are better able to start small businesses and move their small businesses here. According to the Bureau of Labor Statistics small businesses create two thirds of new jobs, with a third of those created by startups. Other statistics find a smaller advantage to small businesses, but still an advantage. Decreasing the bureaucracy event horizon1, making it easier for individuals to start new businesses without having to hire lawyers and navigators, makes more sense than incentivizing individual business prospects. Reduce taxes for everyone, not a select few, and simplify what remains. That’s the way to attract the kind of ground-up businesses that don’t just create jobs in one facility but create entirely new industries of jobs. August 30, 2017: Does Hurricane Harvey support socialism in Texas? 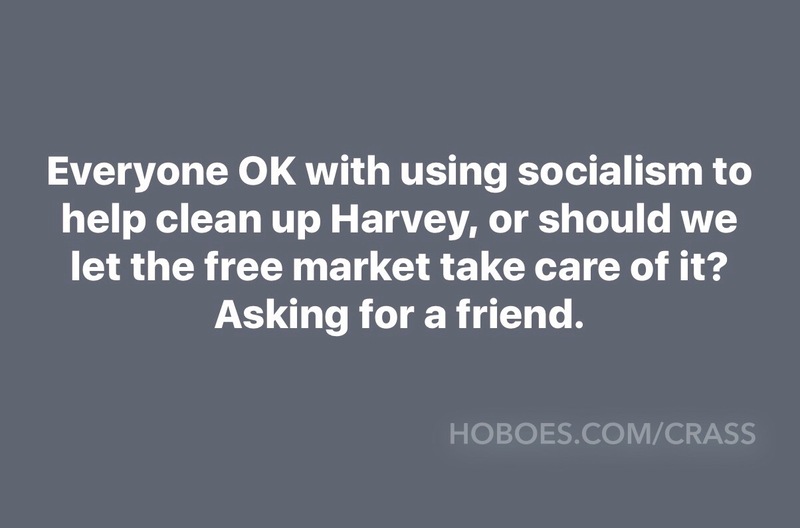 Everyone OK with using socialism to help clean up Harvey, or should we let the free market take care of it? Asking for a friend. This is the essence of socialism: a protection racket on behalf of national-level socialist policies. Government takes resources from Peter and from Paul. Paul undergoes a disaster. The left asks, during a disaster, would Paul rather rely on his own resources and on whatever Peter can offer, or on the government? They ask this knowing that the government already has both Paul’s resources and Peter’s. The question is corrupt on its face. It reveals socialism as, literally, mafia-style government. The non-corrupt formulation would be, would you rather we gave you and Peter all of your resources back, and let you keep them all in the future, and rely on voluntary assistance during this disaster? Or would you prefer that we provide assistance using whatever is left after we pay all the bureaucrats managing your assistance, after we buy things you don’t need because we don’t know your needs as well as you do, after we ignore corruption because it isn’t our money, after all, after we tell Peter to go away because he doesn’t have the right permits? The free market is people working together without force. As a Texan1, I think it’d be a great idea to let Texans and anyone else who wants to provide assistance freely opt out of the federal taxes that pay for what the left is here calling socialism. Charity at the point of a gun is not charity. It is corruption to take taxes from people at the threat of prison and call it charity. October 28, 2016: Round Rock extends dangerously low speed limits on Highway 79? 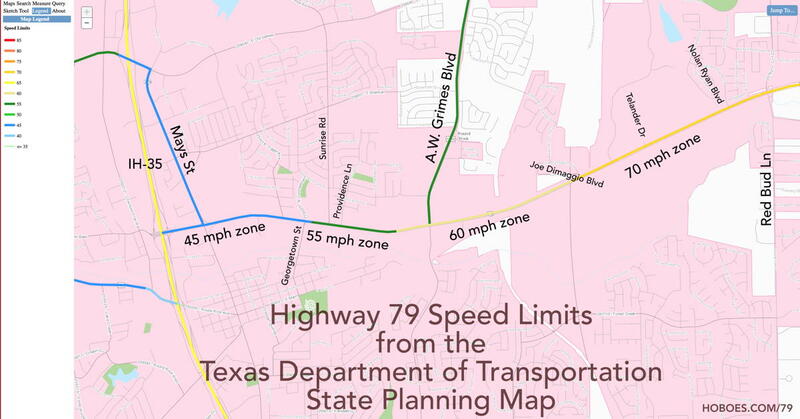 Texas Statewide Planning Map zoomed in on Highway 79 east of IH-35 and west of Red Bud Lane. Last night, the Round Rock city council approved extending lower speed limit zones on Highway 79 within the city limits. I wasn’t planning on writing about this. I found out about the proposed reduction of speed limits on Highway 79 late in the game, and almost never use Highway 79 anyway. The City Council’s concerns mostly (and entirely, during the second reading) were that the state was going to go ahead and reduce these speed limits anyway, regardless of what Round Rock did, so they might as well do the same, to be nice to the state. Setting a speed limit based on the 85th percentile speed was originally based on safety. Specifically, research at the time had shown that traveling at or around one standard deviation above the mean operating speed (which is approximately the 85th percentile speed) yields the lowest crash risk for drivers. Furthermore, crash risk increases rapidly for drivers traveling two standard deviations or more above or below the mean operating speed. Therefore, the 85th percentile speed separates acceptable speed behavior from unsafe speed behavior that disproportionately contributes to crash risk. The problem with reducing speed limits to address high accident rates along Highway 79 is that there is an alternative explanation for a higher accident rate that better fits the speed survey data performed by the Texas Department of Transportation: Round Rock’s speed limits along Highway 79 are already too low. They appear to be set significantly below the 85th percentile. Texas and Round Rock last modified January 31st, 2019.